NATO, The IMF, Divisions, Grexit… Looking Out To 2020: European Wars? second, what are the « natural » sparks, likely to give birth to enormous friction between tectonic plates, the best image evoking the geopolitical rebalancing underway. Perspectives : NATO, the IMF, divisions, Grexit… Looking out to 2020: the return of European wars ? To believe our media, it would seem that the whole world is hanging onto the Greek agreement sought by the EU, the ECB and the IMF. 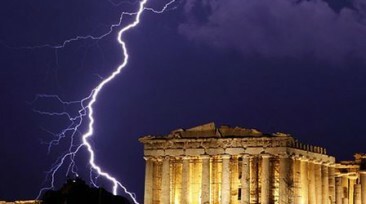 Between sudden developments and stalemate the tension is rising and from now on a Greek payment default isn’t excluded. Cataclysm or opportunity? As we have always said, and continue to say, Greece will stay in the Eurozone. It’s strange that, until just recently, all the media associated default and Grexit. This time has passed : the two problems are henceforth clearly separated, as they should be, and it’s a sign that Greece will keep the single currency. Whether it defaults is a possibility on the other hand. And if it’s the case, this will be a deliberate default, organized and even planned, between Europeans. The Greek case hasn’t been under the global microscope for the last six years for the outcome of the crisis to happen in an unexpected fashion. Besides we are seeing the Eurozone being taken in hand politically, with Merkel and Hollande who want a “strengthening of the Eurozone”  with Juncker who is breathing life into a new political energy and, with Sigmar Gabriel (the German Vice Chancellor) and Emmanuel Macron (the French Minister of the Economy) who are demanding a “radical integration” of the Eurozone. Clearly, all this isn’t very compatible with a disorderly Greek exit from the Eurozone. Neither Juncker nor Tsipras, who have been struggling for months to get an agreement, expect a Grexit. A Grexit which is only a fantasy of the financial markets and the media. Certainly, this Grexit had been sought, deliberately or not, by some players in the poker game currently being played, and particularly the Washington player. Everyone knows the IMF’s historical position as regards managing sovereign debt. The Greek case is no exception : of the three members of the troika, the IMF is by far the most ideologically exacting in its requests as regards Greece. If the Greek tragedy has lasted so long, it’s not the size of the problem which is in question. To be sure it was necessary to inject around 240 billion€ into the Greek economy – or rather into the Greek banks and financial system, so that they didn’t collapse (which would have risked dragging down the whole European system). An amount which only represents a quarter of the ECB’s QE, for example, or a small part of the European recovery and bank support plans. No, if the Greek tragedy has lasted for so long it’s because there is another reason. The Germans don’t want to pay ? They are not the only ones to pay (they only represent 22% of funds lent), and they have always done so up until now, without too much fuss in the end. Rather go and look for the reason at the IMF, its excessive demands and far too neoliberal for the European continent. An “ally” imposed by Washington in 2010 but which represents less than 20% in aid (of which more than half has now been repaid); a troublesome ally which Europe would like to get rid of so as to manage its problem alone, without US interference. Especially since it has finally created the means of resolving this problem, thanks particularly to the EFSF (European Financial Stability Facility), then its successor the ESM (European Stability Mechanism). Figure 1 – Greek debt distribution (320 billion €). Source : La Croix. The outcome of the Greek problem is therefore intimately linked to the resolution of the IMF one. A problem which is worth “no more than” 21 billion Euros. Figure 2 – Amounts due by Athens to its creditors and their repayment schedule Source : WSJ. Many sources are skeptical that Greece has the amount demanded by the IMF as that 30 June (1.6 billion Euros) and the Interior Minister himself has ruled out an IMF repayment without outside help. To believe the Minister of the Economy, Yanis Varoufakis (who laments the method used and would have liked to negotiate directly with the European Member States), the troika has actually never really negotiated and satisfies itself with imposing its requirements. One way to play poker by betting that Greece would fold its hand ? Perhaps. But especially a technocratic management of a Greek crisis with clear political implications… and a very risky game because the messages sent by the Greek government to the European people (whether it be Tsipras’ platform or Varouflakis’ interviews in the European newspapers) are clear and our finishing by bearing fruit : who doesn’t understand that they are right and that they have, moreover, put in an extraordinary willingness to continue negotiations without using their decisive argument – default and Eurozone exit ? This is the idea that we have supported for several months already, that there is a tacit agreement between Greece and the Eurogroup, where the Tsipras government has been sent into battle against the IMF and its unreasonable demands. Will European leaders have the courage to take on an outright payment default by Greece ? Probably not because the consequences are quite unpredictable. But another normal solution exists, as Varoufakis mentions : that the ESM (which was created for this) advance the money that Greece owes to the IMF. No payment default, European solidarity and an ousting of the IMF (since the latter would be fully reimbursed) : there are many advantages to this solution. This would even suit the IMF, because it clearly understands that everyone is now in the same boat and that it’s better to be repaid by Europe than to continue pouring oil on the flames and risk the whole financial system exploding. And then, let’s imagine for a second the message a refusal of Greek reimbursement to the IMF would send towards all this institution’s debtors. Does the IMF really envisage going to the end of reason ? Or isn’t this, as we have thought for several months, only a piece of showmanship between players who all have an interest in change and for that need a situation of extreme tension to justify their moves ? The Varoufakis solution is undoubtedly the right compromise. But if it really can’t be applied, there is another one, more violent and unpredictable but with the same potential for ending the crisis. Payment default in the Eurozone : dream or nightmare ? In reality, at the point where the negotiations are, the other most credible alternative now is the most violent : let Greece default partially. A priori this would require far more political courage than our leaders are capable of – unless European procrastination pushes Tsipras to the limit (one mustn’t forget that here he has a big card up his sleeve). According to our team this option is, therefore, unlikely. That said it would have interesting consequences and increasingly less taboo. Actually, it would require an examination of Eurozone debts from all sides (and possibly global). Because why relieve Greece of part of its debt when Spain, Italy, Portugal or France, for example, are also struggling with their debt ? This would have the merit of launching some thought on the subject, with the possibility of purely and simply wiping off a portion of public debt. Private debt has been changed into sovereign debt which is crushing the states, and not only Greece, henceforth incapable of the least action of economic revitalization. A forced cleansing through a partial and thought out default would certainly have disagreeable consequences for some parasite financial establishments, but it would finally be a way of balancing the system – this balancing which is the key to exiting the global systemic crisis. The whole negotiation around the emblematic Greek case is undoubtedly, above all and especially, a good time for thought and preparation of the application of a final solution which could, after all why not, entail pushing the Greeks to trigger the large bomb cancelling the debts which are crushing the planet. Source : Le Monde, 13/06/2015. Source : The Guardian, 03/06/2015. “The IMF still taking a hard line”; “The IMF more demanding than the Commission”… Source : Le Monde, 27/05/2015. Read this very clear interview: Tagesspiegel, 09/06/2015. A recent example concerns a remark by Varoufakis pleading not guilty over the government’s incapacity to deal with the tax evasion question taking account of the fact that the country’s legal system was at a halt through lack of money (see the previous link). How to reply to that ? The stakes are well summarized here : Bloomberg, 25/05/2015. 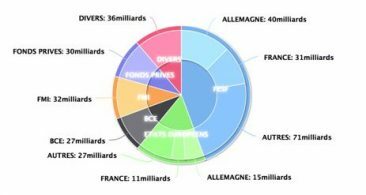 Some have already begun : 60% of French public debt would be “illegitimate”. From there to clearing it is only one step. Source : The Guardian, 09/06/2014. At a minimum, clearing the debt held by other European States can’t hurt, but the amounts aren’t very high.